It’s probably safe to say that every modern parent would ideally like to do all they can to steer their kids away from the trappings of modern technology and more toward traditional pursuits like arts and crafts. The trouble these days is that once a kid gets well and truly hooked on the Internet for example, all the card making supplies and modelling clay in the world aren’t going to persuade them to take what appears to be a step back in time. 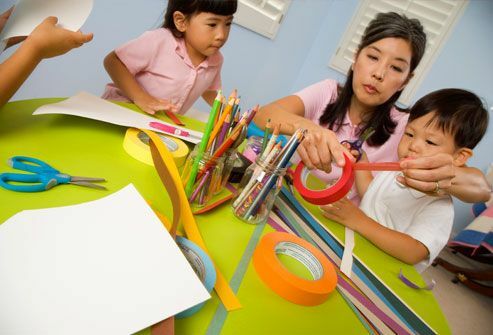 This is why it’s crucial to get kids involved in arts and crafts at home from the earliest possible age, though as tends to be the case with most things involving kids, it can be easier said than done to pull off. What starts life as a whimsical idea for family harmony can quickly turn into the mother of all headaches – most of which can be avoided with a little proactive thought and planning. First and foremost, if you expect the whole saga to play out without a spec of mess creeping into the equation, you can forget about going any further. The simple fact of the matter is that arts and crafts are by their very nature extremely messy – add kids into the mix and you’re looking at setting off an art-bomb right in the middle of your home. The good news however is that these days you can pick up pretty much any supplies for any purpose which are 100% washable and non-toxic to boot. So while there’s no way of avoiding mess, you can at least tackle it when it does occur…as it will. Quite often, parents will take something like a card, a picture or an object and ask their kids to recreate it using the materials available. This isn’t bad practice on occasion, but it can be so much more effective and beneficial to allow kids to pretty much go their own way with no set goal in mind. The reason being that this will allow them to use their imagination to its fullest potential, perhaps taking you on an interesting ride into the deepest depths of their thoughts and dreams. Maybe just give them a vague idea of what it is they’re doing and then let them go wild – you might be surprised what they come up with! It’s a good idea in the first few instances at least to expose your kids to a wide variety of arts and craft products, covering a variety of different areas. From clay to paints to cards to paper and really anything else you can get your hands on, it’s important to find out where your kids’ interests lie in order to then fully encourage them. Some kids will take to painting like a duck to water, others will surprise the living daylights out of you with their clay modelling skills and others will excel in other areas. In any and all cases, find out where their interests lie and do your very best to nurture and develop them. In a similar vein, never assume that just because you yourself are into fine art that the kids will be interested in painting. It can be quite disappointing to take home a glorious set of art supplies only to find that the kids are more interested in throwing paint at each-other than anywhere near the paper, but as is the case with every adult the world over, you can’t expect every kid to be interested in every craft. It’s the old ‘forcing a square peg into a round whole’ scenario – quite fruitless. One of the biggest mistakes you can make is choosing a craft area that has to be set up, taken down and scrubbed intently after each session – you’ll soon find any excuse in the world not to bother. Instead, it’s a much better idea to find and allocate an area that can be used to keep things up and running to the largest possible extent at all times. This way, dipping in and out of all manner of projects becomes much easier and more fun. Last but not least, feel free to perpetuate the old cliché of treating everything your kids come up with like the lost Rembrandt the world has been seeking for decades. The more they see your delight in what they do, the more of it they’ll want to do and the better their skills will develop over time.